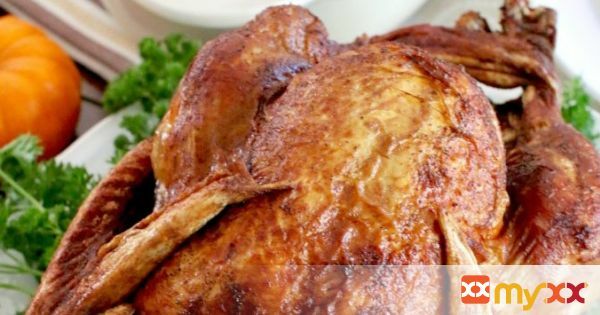 Deep fried turkey, great for the Holiday's! 2. Get out your electric fryer and oil:Remove the frying basket. Fill fryer with oil to the fill line indicated inside the fryer. Do not fill above this line. You will probably have some oil leftover depending on the size of your fryer. Preheat the oil to 375f degrees. This may take about an hour. 3. Prep turkey: Remove the thawed turkey from the outer wrapping. Remove any giblets from the cavity of the turkey. Many times the giblets (liver, heart, gizzard, and neck) will be in a bag for you to pull out but sometimes they aren't. Pat the turkey dry and set it aside. Spray the frying basket with no-stick cooking spray. Place thawed turkey, breast-side up into the frying basket. Sprinkle the entire outside with McCormick Rotisserie Chicken Seasoning. Make sure it covers everywhere and rub it in with your hands to make sure it covers all the outer parts. Then pour the seasoning into the inside. This will add additional flavor to the meat while it cooks. 5. Time to eat: Once the turkey is cooked, attach extension tool to the frying basket and slowly raise the basket. Allow oil to completely drain from the basket. Then carefully remove the turkey from the basket onto a serving platter. It's best to use oven gloves for this or if you have large meat forks, you can use those to remove the turkey. I like to put some fresh, curly parsley all around the turkey to make it pretty.